February 24, 2016 February 25, 2016 / Kendra S.
Well, I’m not leaving TODAY, but in 6 WEEKS I’m heading to New York City for Tartan Week! That’s right, the Big Apple! I can hardly stand my excitement! Not only has this trip been in the works since last year, it was recently announced that SAM HEUGHAN will be the Tartan Day Parade Grand Marshal! What?!?!?!? Even MORE exciting, there will be hundreds of Outlander fans hitting the streets of NYC to celebrate! With all these excited Outlanders out and about, how’s a girl supposed to recognize a fellow Heughligan. Well as if our undying sense of loyalty isn’t enough, we also have Chibi Jamie at our backs. Quite literally. To celebrate the momentous occasion of our laird being Grand Marshal, the admins of Heughan’s Heughligans are proud to present a LIMITED re-release of our very popular Chibi Jamie design. Recolored and proudly resting atop a mini skyscraper banner he takes the guesswork out of finding a fellow fangirl (or boy!). 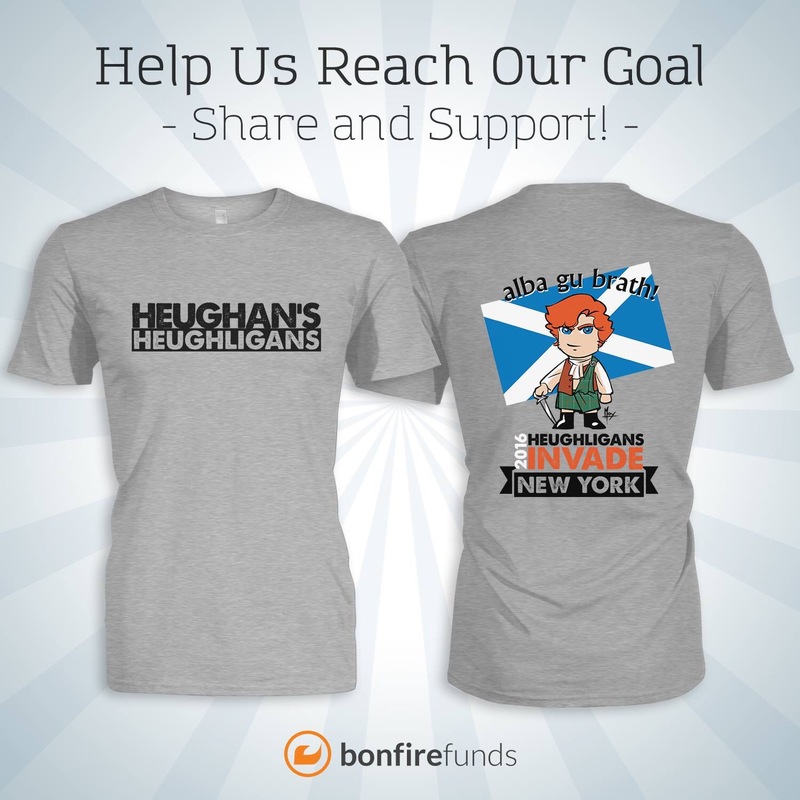 Please visit: www.bonfirefunds.com/chibi-jamie-relaunch-for-2016-ny-tartan-week to reserve your own special edition shirt. But wait, there’s more! 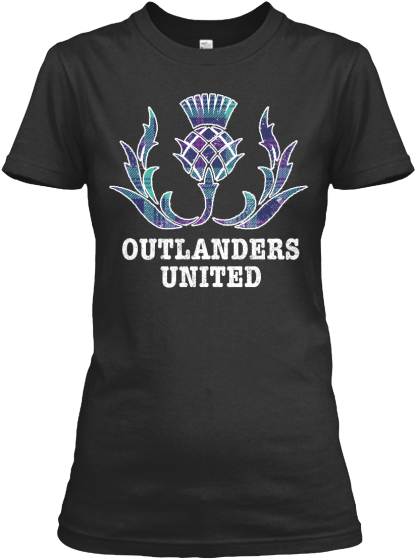 Outlanders United also has a tee available for purchase. Designed by the talented Audrey Landry, purchase of this shirt will go to defraying travel expenses for the 78th Fraser Highlanders who will be joining OU from Quebec City. In honor of Grand Marshall, Sam Heughan, a minimum of $5 from each sale will be donated by Outlanders United to Youth Theatre Arts Scotland, of which Sam is a patron. Please visit: teespring.com/ou2016-tartan-week-parade for details. This is THE SHIRT to wear if you are marching! Not only that, they are perfect to wear as a spectator to show your support to your fellow Outlander fans who are marching in the parade as representatives of the fandom at large! – The Heughligans are not registered alone to march, but some of us will be representing the fandom as a whole under the Outlanders United banner. – You do not need a pass to watch! It’s an amazingly fun public event, so just grab some sidewalk and enjoy! If you wear your Heughligans shirt, you’re sure to find some fellow fans. – Sam is the grand marshal, so he will be leading the parade. As long as you are in place before it starts, you’ll easily get a peek at our leading man as he struts his stuff down the route. – are Heughan Heughligans registered in the parade or as spectators? – do we need a pass or something just to watch the parade on the side? – where is the best place to be to have a wee look at our beloved Sam?